Delectable dumplings with water chestnuts, ginger and spring onions from Jamie’s Friday Night Feast Cookbook. Liv’s kids are obsessed with Asian food, especially dumplings. With that in mind, I wanted to give her a fail-safe recipe to cook up at home for everyone to enjoy. You can get ahead by making the dumplings in advance, ready to cook to order when you want to tuck in – get your lucky guests ready and waiting at the table. For the dough, place the flour in a mixing bowl, gradually add ­20ml of warm water and bring together into a ball of dough. Knead on a clean flour-dusted surface for 5 minutes, or until smooth, then wrap in clingfilm and leave aside to rest for 30 minutes while you make the filling. Chop two-thirds of the prawns into ­cm cubes, finely chop the rest, then place in a bowl. Drain the water chestnuts, peel the ginger, then finely chop both. Trim and finely slice the spring onions. Add it all to the bowl, then beat and add the egg, along with a good pinch of sea salt, the white pepper, Shaoxing rice wine and sesame oil. Mix well. On a clean flour-dusted surface, knead the dough a few times, then cut in half. Cover half the dough with a clean damp tea towel while you roll the rest into a sausage, roughly 40cm long. Break off 1.5cm pieces and roll each one into a ball, then flatten into an 8cm round, roughly 2mm thick. Using a pastry brush, lightly brush around the edge of each round with water, then dot 1­ level tablespoon of filling in the centre. Fold the dough in half over the filling, cupping your hands around to seal and get rid of any air bubbles. Make the edge wavy like a shell, placing the dumplings on a floured plate as you go. To cook the dumplings, put a large non-stick frying pan on a medium heat with 1 tablespoon of vegetable oil. Arrange the first batch of dumplings inside and fry until golden on the bottom. Meanwhile, whisk 4 heaped teaspoons of flour with 800ml of water (re-whisk between batches). Once the dumpling bottoms are golden, pour in enough floury water to come ­cm up the side of the pan. Cover with a tight-fitting lid and simmer for 5 minutes, then remove the lid until it begins to fry again – you’ll notice a delicate pancake starting to form and encase the dumplings. When it’s nicely golden, confidently bang it out upside down on to a serving board. Repeat with the remaining dumplings and floury water. Mix up your own dipping sauce, to taste, using a combination of the condiments. Delicious served as part of a wider dim sum selection. 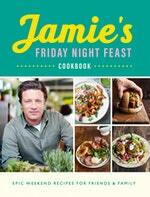 JAMIE’S FRIDAY NIGHT FEAST COOKBOOK BY JAMIE OLIVER IS PUBLISHED BY PENGUIN RANDOM HOUSE © JAMIE OLIVER ENTERPRISES LIMITED. 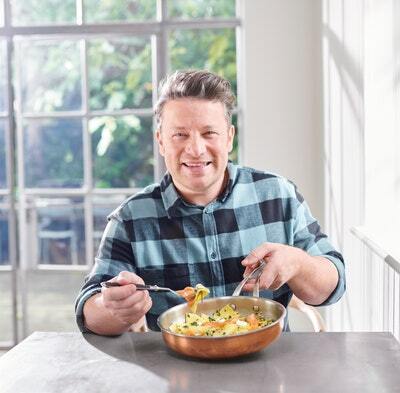 Cook up an epic feast for friends and family with Jamie Oliver's new cookbook, featuring the best of the best food from the hit TV series Jamie & Jimmy's Friday Night Feast. The perfect pudding, à la Allyson Gofton. Lashings of cream or ice-cream to accompany this hearty family favourite will add to this dessert’s enjoyment! Lemon oil has an amazing ability to cut through grease, making it the star ingredient for this recipe. The method is simple, all you’ll need is a handful of basic ingredients and a jar to mix up.